Information on the railway you can find on www.bahn.com. It is an approximately 20-minute walk from the station to the Würzburg Residence. Bus from Juliuspromenade: 9 to "Residenz"
Bus from Juliuspromenade: 6, 16 to "Mainfranken Theater"
Bus from bus station: 12, 14, 20, 28 to "Mainfranken Theater"
Tram from central station: 1, 3, 5 to "Dom"
Continue on the B 8 via Biebelried to Würzburg. At the traffic light in Würzburg get in the left-hand lane in the direction of Ansbach / Schwäbisch Hall. Stay on the Stadtring Süd until the Frauenland / Stadtmitte exit. Turn off here and head for the Stadtmitte (city centre). You are now on Sieboldstrasse: follow the signs to the Residence car park ("Parkplatz Residenz"). Continue on the B 19 dual carriageway to Würzburg (ca. 7 km). Get in the left-hand lane before the Würzburg place name sign and continue straight on (Stadtring Süd) in the direction of Ansbach / Schwäbisch Hall. Stay on the Stadtring until the Frauenland / Stadtmitte exit. Turn off here and head for the Stadtmitte (city centre). You are now on Sieboldstrasse: follow the signs to the Residence car park ("Parkplatz Residenz"). Continue on the B 8 to Würzburg. At the traffic light in Würzburg get in the left-hand lane in the direction of Ansbach / Schwäbisch Hall. Stay on the Stadtring Süd until the Frauenland / Stadtmitte exit. Turn off here and head for the Stadtmitte (city centre). You are now on Sieboldstrasse: follow the signs to the Residence car park ("Parkplatz Residenz"). 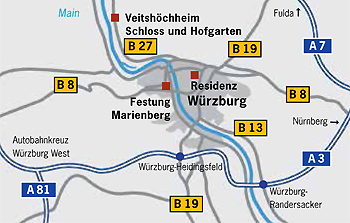 At the Würzburg-West junction stay on the A 3 – or, if on the A 81, take the A 3 in the direction of Würzburg / Nürnberg – and take the Heidingsfeld exit. Continue on the B 19 dual carriageway to Würzburg (ca. 7 km). ). Get in the left-hand lane before the Würzburg place name sign and continue straight on (Stadtring Süd) in the direction of Ansbach / Schwäbisch Hall. Stay on the Stadtring until the Frauenland / Stadtmitte exit. Turn off here and head for the Stadtmitte (city centre). You are now on Sieboldstrasse: follow the signs to the Residence car park ("Parkplatz Residenz"). In front of the Residence there are 400 chargeable parking places for cars. In the immediate vicinity of the Residence (Husarenstrasse) there are 15 parking places for coaches. Route planners you can find on http://auto.abacho.de/routenplaner/.